The following guide explains how to install One Stop Order Processing on to a second machine.
. 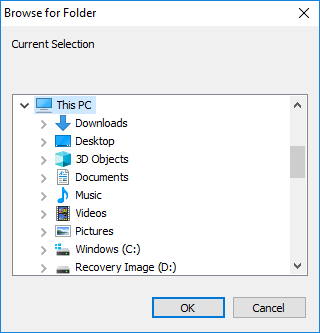 Create a shared drive on the original PC - This article explains how to create a shared drive and how to set the correct access permissions. Because your site has already been created on your other PC, you need to open the site up rather than create a new site. 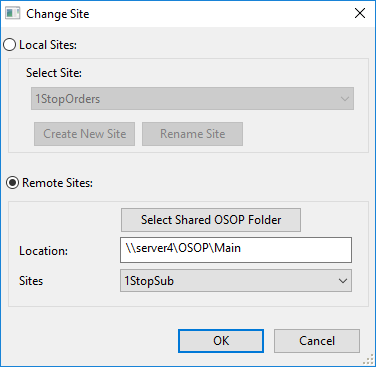 In One Stop Order Processing go to "File->Open->Site", the Change Site dialog will open (shown below) and you will need to choose the "Remote Sites" option. 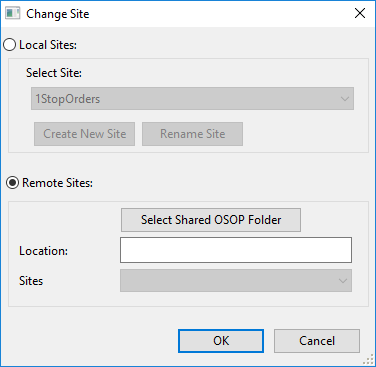 In the Change Site dialog select Remote Sites and click on the Select Shared OSOP folder button. 2 Select My Network Places (or Network on some systems) and the relevant PC. Select the main shared folder (OSOP). Click on OK.
3 The first available site will be selected. If there is more than 1 site select the relevant site and click on OK.
You will now be able to see the orders from your site on this PC. Reports and general settings are PC specific, so if you make changes you may need to make the changes on both PCs.